Most brick-and-mortar businesses that accept plastic rely on heavy, static readers to process credit cards at the checkout counter. In fact, these stationary terminals have been a staple of retail for decades. With the birth of mobile payment processing, businesses could suddenly begin accepting credit cards on the go. All you need is a smartphone or tablet and a card reader that either pairs with your device using a Bluetooth connection or one that fits directly into the headphone jack. Then you can start dipping or swiping credit cards — just as you would with a traditional terminal. This portability is ideal for field technicians and traveling sales reps who frequently interface with customers off-site. The same is true for any businesses that regularly attend events, conferences and other “sales opportunities” away from home. You don’t have to turn away sales since you can accept mobile payments (via credit card) — anytime and anywhere. Your company gets paid faster, without invoicing delays or chasing down warm prospects that have since turned cold. The carbon footprint of your organization shrinks, since all of the payment processing is done electronically without paper invoices and receipts. As an added benefit, your teams don’t have to carry clunky hardware. Most company employees already have phones on them, and the card reader weighs only a few ounces. However, conventional mobile credit card processing does present a challenge. Let’s take a look. In 2015, the payment card industry introduced new liability rules designed to move merchants and consumers away from legacy credit cards to the more secure EMV standard. Older credit cards — with their magnetic stripes — are easy to clone. Thus, they’re very susceptible to fraud and abuse. By contrast, EMV credit cards come with embedded security chips that are incredibly difficult to duplicate. For a transaction to go through at the cash register, customers must physically insert their security chips into the credit card reader. With these liability rules in place, merchants who don’t use EMV-ready terminals are now penalized if fraud infects their payment environments. Not only do they have to cover out-of-pocket expenses, but they also are increasingly subjected to hefty fines. Not surprisingly, many businesses have moved to the EMV standard, especially in the brick-and-mortar world. That said, EMV credit card adoption among mobile payments has been relatively slow. That’s because most detachable readers still rely on the swipe-and-sign technology used for older, magnetic stripe plastic. A More Secure Way to Accept Mobile Payments? Mobile payment hardware has evolved substantially over the past few years. There now exists a range of credit card processing solutions that combine the convenience of mobile technology with the security of chip-enabled credit and debit cards. Your business is less likely to experience fraud since a greater percentage of off-site sales will be EMV-compliant. However, you can still “swipe” the old-fashioned way for any customers who only have legacy plastic. Less fraud doesn’t just mean peace of mind. It also reduces your exposure to penalties, fines and out-of-pocket losses. These costly fees await any merchant who isn’t compliant with the more secure EMV standard. At BluePay, we specialize in secure EMV payment solutions, whether you wish to accept credit cards at a static location or process sales on the go. For mobile, we offer two options. BluePay’s Mobile EMV Processing app interfaces with your existing mobile app to send encrypted EMV and swipe data directly to the BluePay Gateway. This means you can track all of your transactions in one centralized location for easier reporting and reconciliation. 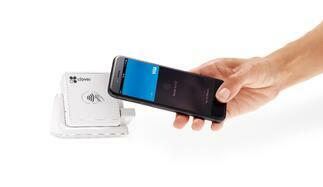 Another popular mobile payment solution is the Clover Go. Like a growing number of portable readers, the Clover Go can accept both mobile EMV payments and those made with “swiped” legacy credit cards. This powerful device can also process contactless payments using near field communication (NFC) technology. This means your customers don’t even need to have plastic on them. If they have virtual wallets attached to their Androids, iPhones or NFC-enabled wearables, those customers can securely buy whatever you’re selling — no matter where your teams go. As with all of our payment processing solutions, BluePay’s mobile EMV payments benefit from the latest in PCI-compliant data security — complete with additional fraud management tools to help keep your customers’ payment details safe. If you’d like to learn more about our unique approach to secure mobile EMV payments, schedule a free consultation with our merchant services team today.